It's alive! The Emerald Ultra guitar - not your run-of-the-mill guitar hero's guitar. Steve Vai just kicked off his Story Of Light Tour, during which music fans will undoubtedly see the master guitarist perform with a variety of his Ibanez JEM Signature Series Steve Vai models. But concertgoers might be in for something of a shock when Vai straps on an unorthodox, otherworldly looking instrument for the song The Ultra Zone - a one-of-a-kind Emerald Ultra guitar, custom-built for him by Alister Hay of the Ireland-based Emerald Guitars. The design of the guitar is based on the Aaron Brown's illustration for Vai's 1999 album, The Ultra Zone, which depicts an "alien Steve" playing a futuristic-looking axe. Hay was so taken with the image that he set about building Vai a guitar that matched the illustration. 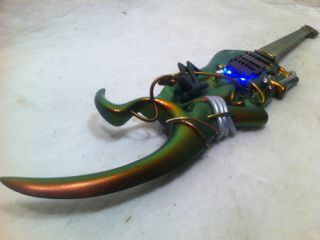 The Emerald Ultra guitar (its body is constructed from a carbon/glass composite and its neck is carbon fibre) features built-in lasers and what is said to be a "chameleon-like tendency to change color." According to Vai, "At ﬁrst I wasn't sure if I should plug it in and play it or crawl inside of it and ﬂy it to Venus, so I did both... at the same time. After handling it, it was obvious that it was not just a masterpiece extravaganza of a carving frenzy, but it was also a very well crafted and playable instrument. "In the years following my receiving the Ultra guitar, Alistair has continued to create unique guitars that are constructed from original designs and materials that produce stunning visual and audible heights, but mine is the only one that can ﬂy to Venus and back without missing a beat." Steve Vai in rehearsal with his Emerald Ultra guitar. Says Hay, "Steve Vai is truly one of the most creative, accomplished, inﬂuential guitarists of his generation, and to see him perform on stage in front of thousands of fans playing the guitar I made for him... it's a real milestone for Emerald Guitars. And for me, personally, it's a dream come true." Designer Hay with his "Ultra"-spacey creation.